Joanna White Resale is an estate sale company serving the Mount Pleasant, SC area. We are hosting an estate sale with an amazing collection of vintage clothes, purses, and jewelry! We will be selling furniture, decorative items, kitchenware, sterling silver and more!! Everything is priced to sell! This is an estate sale full of eclectic finds, sterling silver, furniture, kitchenware, costume jewelry and more! We will be hosting an estate sale at a home in the Sandhurst Neighborhood in Charleston. The sale will include unique finds, vintage/antique furniture, art, kitchen ware, jewelry, books, decorative items, and more! Estate sale this Friday and Saturday! Selling many unique decorative items, kitchenware, vintage furniture, rugs, and art. Store closing! 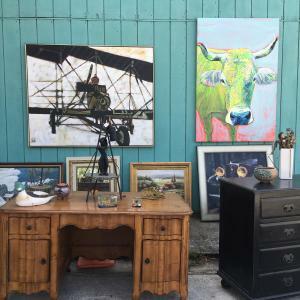 Furniture, lighting, decorative items, vintage, antiques, and more! Everything must go. Priced to sell! 1214 Fairmont Avenue starting Friday at 10am continuing through Sunday!